These really need to be seen in natural like to show the holographic sparkle of INM Northern Lights. I'll try and update tomorrow with a few more pics when the sun is up! Inspiration for these nails was of course the clock with it's hands at midnight, the glittering and awe inspiring pumpkin-turned-coach, and the swirls of magic dancing about Cinderella as she received her glass slippers oh yeah and the rest but I only care about the slippers. 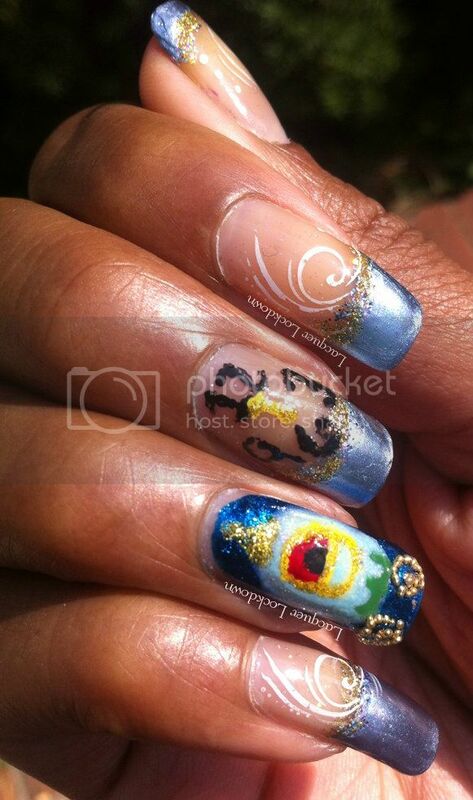 Initially I did try to create the glass slippers on my nails but it looked crazy no matter which why I did it. A glass slipper only becomes a shoe when it is bestowed upon the princesses foot. Until then it's just a pretty piece of clear glass yes? The color of Essie's Blue Rhapsody to me was a perfect allusion to Miss. Rella's dress. So here we are having taken another trip down the twisty and insane path that is my nostalgia. Oh and just in case you didn't know it Disney is celebrating there Blue Ray release of Cinderella this year in an all out fashion including, gasp, twenty pair of limited edition Christian Louboutin swarovski encrusted butterfly adorned shoes inspired by the glass slipper themselves. And I will leave you with this picture to drool away over! Right now I'm cursing my fate that I'm neither Dita Von Tease or Mariah Carey who were already slotted to own one of the twenty coveted pair. Alas to be a commoner and poor just like Cinderella. Lol! This looks gorgeous, I love the inspiration behind it! The carriage is so cool! 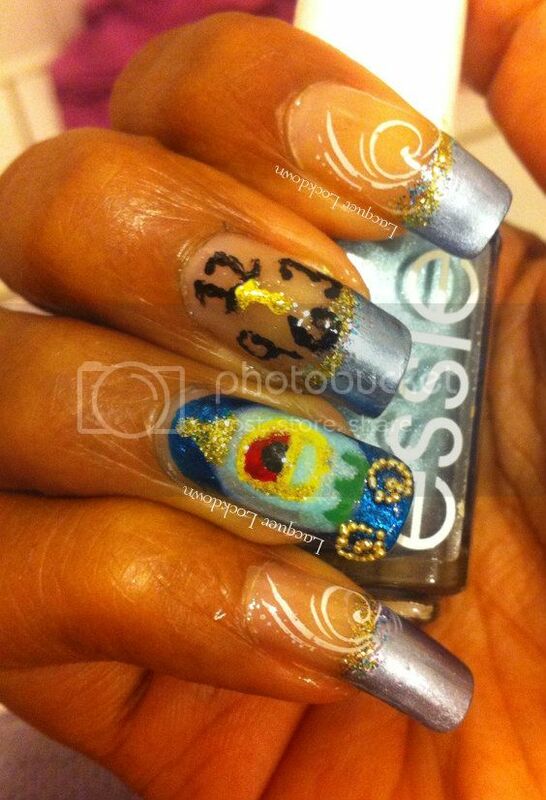 Ur Disney inspired nails looks so creative! Very pretty mani! OMG! Those shoes are soooo wonderful! 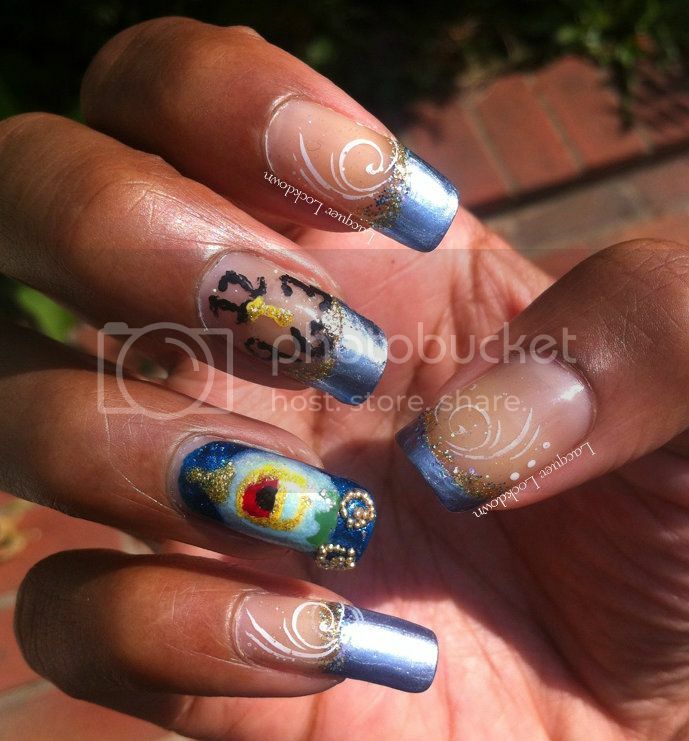 Your nails are amazing Tamira and wow the shoes that inspired you, they are so beautiful! Thanks Jen! These weren't the shoes that inspired me otherwise my mani would be encrusted in rhinestones and butterflies! Hmmm now I'm thinking I should do one in homage to these bad boys! I have zero plans or interest in getting married right now but if I did it'd have to be in these shoes hahaha. WOW THOSE SHOES !! Love your mani as usual :) How long did this take you? These nails are so adorable! I love your use of micro beads as wheels! And those shoes are gorgeous! !